Nobody likes to receive spam, but nearly every business can cultivate customers and increase sales through the effective and judicious use of e-mail marketing. With a well-managed e-mail list, you can keep your customers informed about company news, product introductions, and promotions. To help you manage everything effectively, e-mail marketing services can organize your contacts, track readership, and evaluate customers' interest in what you're sending out. You'll build a newsletter template, import and manage the contact list, send messages, and audit the results. Many services can do the job, and they share many similarities. Here are a few good e-mail marketing services to check out. 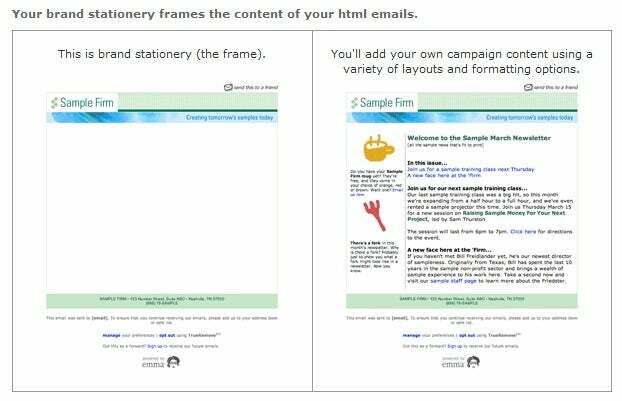 Emma designs the basic e-mail format to your specifications on the left; after you add content, it looks like the layout on the right. If you want to try your prospects without paying, consider the free version of MailChimp to manage lists of 500 or fewer customers. You can send 3000 total messages each month or, if you like the service, you can pay for the ability to send to more people. JangoMail can connect to your contact databases directly from your mail server, streamlining the process by avoiding the exporting step to bring in new e-mail addresses. No JangoMail branding appears in your messages. Plus, you can initiate e-mail campaigns from your regular e-mail client; you send a message with a special subject line to JangoMail, and the service sends the message to the list of contacts you specify. I like Emma in general, but especially for small businesses that lack the resources to design their own e-mail layout. Other sites offer templates and ways to upload a company logo, but Emma designers merge your assets--a logo, letterhead, URL, or other documents--into your e-mail design. That process costs a $249 setup fee, and you'll pay $30 per month or more depending on the volume of e-mail sent. In this tutorial, I'll explain how to get started with Emma. Be sure that you can legally--and ethically--send to the imported contacts. Emma, like its competitors, imports your current database of contacts after you pinky-swear that those people are okay with receiving e-mail from you. 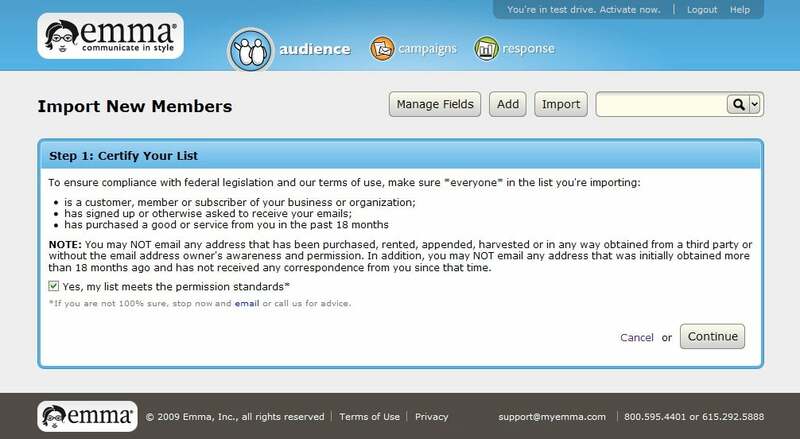 The CAN-SPAM Act says that people you e-mail need to have requested messages, need to have bought a good or service from you recently, or need to have otherwise established a relationship with your business. More important, don't cross the line between sending occasional marketing messages and spamming; overdoing it can cause more harm than sending out nothing at all. From your e-mail application, export a CSV file full of the contacts. For example, in Outlook, choose File, Import and Export. Choose Export to a file and click Next. Choose Comma Separated Values (Windows), and click Next. Select Contacts, click Next, name the file, and click Next. Click Finish. In Emma, choose Audience, Import, and click Create a new import. Click Manage Fields. Emma will normally import just names and e-mail addresses. In this area, you can set it to import phone numbers, physical addresses, and other details to tailor later mailings. Use the Add more fields pop-up menu to pick Mobile Number, for example. Click Add. Repeat the process as needed, or click Create a new field for a custom choice. Click Save & Exit. Click the checkbox to say that you're importing approved addresses, and then click Continue. Click Upload a File. Click Browse, pick the CSV (or .xls) file, and click Continue. In the next page, match your fields to Emma's database options. Use the drop-down menus to select the proper kind of data, such as linking the E-mail option with the row of e-mail addresses. Click Continue. Choose either Add Only or Add & Update. If you import addresses again in the future, the former selection adds only new addresses, while the latter adds new ones and overwrites duplicates with data in your CSV file. Pick a group for the contacts to join; you'll send out mailings based on your groupings. You can change the organization later, but it's easiest to do this right now. If necessary, type a new group name, and click Add. Click Continue. Review everything once more, and click Import. Depending on the size of the list, importing everything could take several minutes.